One of my gran's favourite sweets was peppermint creams and she would always make sure there was extra for my brother and I around Christmas time - mint and white coloured sweets that melted in the mouth! This lovely print from Mabel & Mu really reminded us of that! 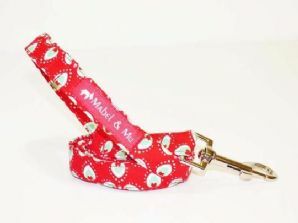 Stunning Vibrant red with Mint & white shapes all over... it’s such a dazzling print & perfect for boys and girls alike.